Great Theme! Thanks will download this. Hi, the Cats Drop Down theme is on of the best themes. But since the last WP version the categories doesn’t work more. Would there be a update? I am trying to save some real estate in my Atahualpa themed blog, and I needed a drop down menu on the side-bars to replace the existing extended lists. I tried adding Multi-level navigation from Pixopoint, but it seems like it wont work unless I pay to get some expert help. Considering how absolutely user-friendly the Atahualpa theme is, I dont want to do that. I am also checking out the cats drop down menu, but I am not sure if I should proceed, especially if there is a steep learning curve. Can someone tell me if there is a Atahualpa-integrated drop down menu which can be used and customized in the simple fashion that is the signature of the Atahualpa theme? I needed a drop down menu. I installed this and it is not dropping down the child pages. What do I need to do? I must confess that when I saw the theme name I immediately thought of a feline version of the infamous Australian Drop Bear. @Tim: It will probably take 2 weeks I’m afraid even though I do nothing but working on these themes. I plan to release a new version of “Atahualpa” this week, then update “Montezuma” (which is quite similar and shouldn’t take long), then Cats Drop Down would be the next to update. Is there anything special you would like to be added to that theme other than fixing errors? I was planning to add some Adsense functionality. Hi. Any word on when this theme is going to be updated? Thanks for your reply. I have comment the lines in sidebar2.php and I am not getting the error message. Thanks again. You can find that in footer.php. Paste the Google code right before that tag. I will update my site the next days and post that tip in a visible place above the comments. Admin: Thanks for answering my last question. “Copy the following code block into every webpage you want to track immediately before the tag. Where is this in the theme design? Thanks again, and love your theme. # the last number (365) is how old (days) posts can be to be included here. Thank you for pointing this out, the hardcoded area in sidebar2.php is gone in 2.21 anyway, and in the next theme version I will hide the “Popular in Cat” widget from WP 2.2 users. Thanks for your reply, I am using WordPress 2.2.2 and MySql version is 5.0.6 and using theme Atahualpa 2.01. I dont have Popular in Cat Widget installed at all, I was using Categories Widget and thats when I just get the error as above and it doesnt show list of my Categories. But If i remove this Categories Widget and leave Left and Right Sidebar as Default sidebar, I get the listing of my categories and if I click on the category then I get the above error in right bar. @rdw: I meant to remove the “Popular in Cat” widget from the sidebar, not the “Categories” widget. What is your WordPress version and do you know your MySQL version (i.e. mysql 3, 4 or 5)? Looks like the “Popular in Cat” widget doesn’t work on older MysQL versions. You are right, If I remove the “Categories Widget”, it shows all the categories i have got and comments in it but still shows this error message in the right hand column. Please advice. Thanks heaps in advance. @rdw: That looks like the “Popular in Cat” widgets isn’t working. If you remove it, do the errors go away, does everything else work? That message you posted is just the mysql query of that widget. There should be an actual error message before or after it? I am ATAHUALPA theme and getting following error when click on category link, Please advise, I am using MYsql 5.0.5 database: Please assist, Thanks Heaps in advance. This theme will get a major update, please check back in 1-2 weeks. An option to add the author will be included among many other things. How do I include the name of the poster automatically into the post? Thanks and I love your theme! 1) It has a whole range of SEO features on the options page where you can add nofollow to certain links and noarchive to certain pages to prevent duplicate content, the theme can also generate meta keywords and descriptions, etc. 2) Looks like all my themes are working in 2.5 and 2.6 beta1 as far as I can see since my themes are rather fresh and thus I was happy enough to not use deprecated WordPress code like you can find in themes that are 2-3 years old. I am almost done with a new test drive site where you’ll be able to test my themes on WP 2.2, 2.3, 2.5 and 2.6 and on a lot of sample content. 1 – Is it Search Engine Optimized? 2 – Is it compatible with WP 2.5? 3 – There will be support for this theme in the future? @Ruth: Installing a Captcha can be cumbersome, maybe another Captcha plugin or widget will work for you. I finally got it fixed. And you were right, there was plugin there so I just deleted it. Obviously, there was something else I had to do to make the plugin work properly, but I was unsure about it, so I just deleted it. Thanks again for the great theme and keep em coming!! I’m using the Cats Drop Down” v. 1.0 theme and if you click on my name here in your comment, you will see the blog and the problem. When you get there,just click on comments and you will see where the captcha is suppose to be, but there are only 2 boxes with little red x marks in them. Also, I’m not using a plugin or any widgets. @Ruth: I would need to know what captcha and which theme you’re using at the very least. If it is a plugin or widget I’d be willing to install it on the affected theme and see if I can spot the problem. I’m not using captcha with any other themes. I’m also using WP 2.5.1. Do you think that would have anything to do with it. I really love the theme and I’ve built out a great looking site using it, so if you have a fix, I would really appreciate it. @John: That would require rewrite parts of the theme I am afraid. It’d probably be better to use a wider theme if the main columns theme width is too narrow for your application. @Ruth: I am not sure if this is related to the theme at all. Does the captcha work with other themes? I love your template! But someone emailed me and said when they tried to comment, the security code (captcha) is not working. I tried it in both IE7 and Firefox and the code is not working. How can I fix that? Thanks again for a great template! My question is: i’d like to add a Amazon Shop Page but how to get no sidebar on the right side cos’ inline frame take a wide space? this is can use at WP 2.5? While the category menu (located between header and main content section) does drop down, the menu for pages (above the header, with rounded tabs) does not drop down, it shows only the first level pages, but no sub or sub-sub pages. The “Pages” widget is a default WP widget and will display links to ALL pages, including the 1st level pages (which are already listed in the top navigation menu with the rounded tabs). 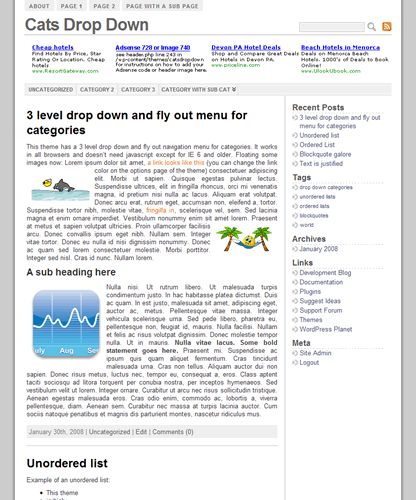 The “Subpages” widget is custom and will only display the sub pages of a given page. The “Subpages” widget needs to be dropped into the first position in the sidebar (on top of other widgets) or it won’t display. It also won’t display if there are no sub pages for the current page, or if the current page is not a “Page” page. My next theme will have drop down menus for both categories and pages, I plan to release it within 2 days. Can I use this for links to other pages on the website? Not simply Posts. Fill in the Category name under “Category name:” and choose a parent category (if any) under “Category parent:”. You can leave “Category slug:” and “Description” blank. Then, whenever you write a new post, you’ll see the option to add the post to any (or several) of the existing categories (or sub or sub-sub categories) on the right hand side of the “Site Admin” -> “Write” -> “Write Post” window. Once a category has at least one post, it will appear in the appropriate place of the drop down menu. In other words, you wouldn’t create the drop down menu itself, instead, you’d create the categories and assign posts to them, and the drop down menu gets created automatically and will be based on your existing category / sub-category / sub-sub-category structure. Where will I find the “how to” of creating the menu and submenus for the dropdown? < ?php include ('sidebar2.php'); ?> in page.php ? The rest of your comment wasn’t displayed. Please use <code>...</code> tags in case you want to post it again. In Bytes for All I have some problems. Hi, Is it possible to have an image (logo) where the title is instead of where the adsense/graphic goes?